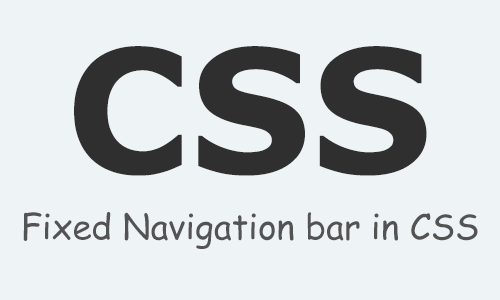 If you want to make a navigation bar which will always be on the top of the page, in this tutorial you are going to learn how to do it. Here we will use basic HTML and CSS (Cascading Style Sheet) for it. Before starting to create it let me tell you a good news and a bad news. Bad News : IE7 and lower doesn't support the Shadow Effect which we are gonna use to make it look good. See the live demo of the navigation bar in IE then you will get to know what's the problem. If you want the shadow effect then you need to create an image with the effect and set it as background image of your "Navigation Bar" a.k.a "DIV". Now we are ready to develop it. HTML Code for menu : Add this code inside body. CSS Code for HTML body : The body margin should be 0px. After making your HTML > Body margin to 0px you will not see a big difference. Now let's design our Navigation bar which Div ID is "nav". Now i'm going to design the title of the page, if you want to design same is i designed you can use the code or you can design as you want. Now we are going to design the links of our navigation menu. ok here you are done with navigation bar, i'll also add some content. After adding content in a div which ID is "body" you will see a problem, some of the content which's on the top is unable to see because navigation bar is overlaying it. To make it proper you will need the margin-top of your content to be around 80px or more than that. In this post i'm using 80px. Now you are completely done with the Fixed Navigation Bar. Don't forget to comment about it, also download source files and watch live demo of it. Get tutorials directly to your inbox subscribe the blog! Nice post , it really helpful. great tutorial, continue the good work! Awesome bro! just 1 suggestion, please make your site look proper and for codes use blockquote style. Anyway thanks for it..
:) Ok, i'll also look to improve the UI of the site! thanks a lot man this is helpful !! How about a way to resize the menu text on browser resize? :-? How about a way to resize the menu text when the browser window is resized? I have never tried it, but i think so you'll need to specify the font-size in percentage. I added white-space:nowrap so that the text doesn't wrap on browser resize. But now when browser is resized smaller than the UL, the out-of-screen LIs are inaccessible. And when testing on smaller screens, most of the nav menu is inaccessible (out of screen). I would also like a way to resize the text when the browser is resized. Is that possible? Can we make the navigation bar to be at the bottom of the page instead of the top? Sorry, how can I put the menu items on the bottom of #nav instead of having them in the middle? Do you have any idea for this issue ? Add this is your CSS stylesheet. Its a great and lovely nav bar, thanks for sharing !! WOW! Awesome. I'm just getting into web development and have been testing out different methods of creating sticky footers....this one worked! Thanks!